The "oldest sea otter in an aquarium or a zoo" hits a milestone year, at the Aquarium of the Pacific. The "oldest sea otter in an aquarium or a zoo" hits a milestone year, at the Aquarium of the Pacific. Visitors to the Long Beach-based aquarium can see Charlie during open hours. "ONE OF HIS FAVORITE TREATS," which, as you probably guessed, is "frozen nalgene tubes filled with a clam and squid smoothie." You can see this yummy squid smoothie-in-a-tube in the video below, in all of its pink/blue amazingness. And, no, this wasn't his only treat; he also was on the receiving end of a seafood cake. So why do so many people know this sweet otter, beyond the fact that his whiskery cuteness inspires smiles for miles? Charlie is "the oldest sea otter in an aquarium or a zoo," making him a very big deal, indeed. 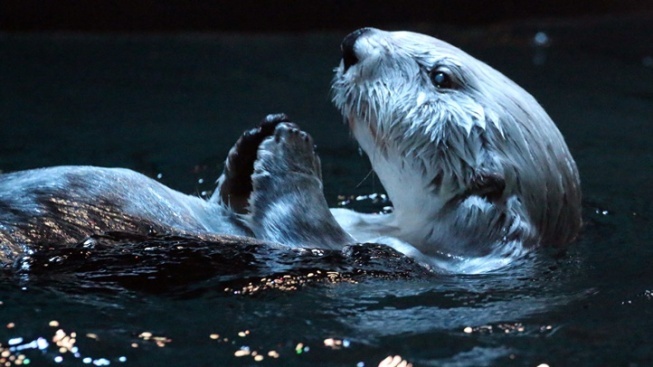 The aquarium posted that male otters, in the wild, have a life span of about "10 to 14 years." Keep on truckin', er, swimmin' Charlie, and happy 21st!